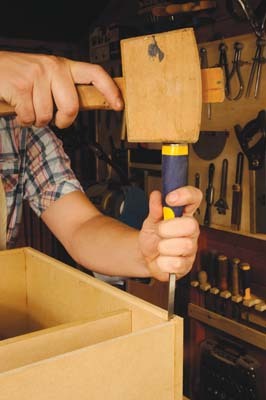 Last issue, we kicked off Pocket Workshop Project, with a look at how I've kitted out a small shed workshop space. Now it's time to use the workshop for the first time. 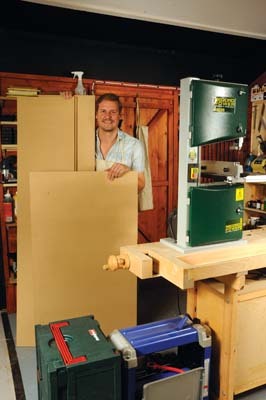 You'll remember I've got Record Power's BS250 bandsaw for the workshop... now all I need is a stand for it. 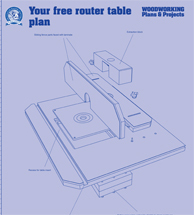 To that end, hereâ€™s the project as I designed and built it. 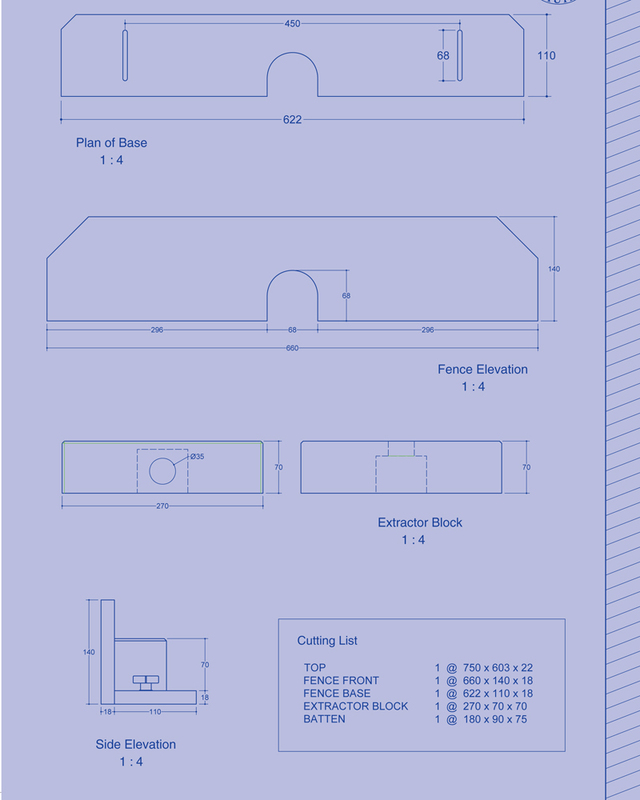 My thinking behind this first shed build was to keep it simple, and use it to have storage for bandsaw blades, fences and spares... and any other odds and sods. 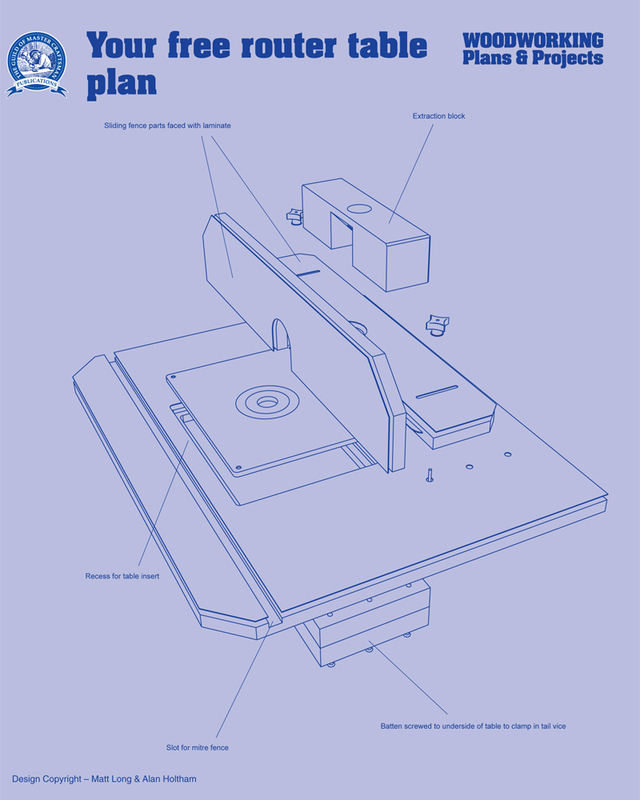 To that end, you can see my design has two shelves, and an upright storage compartment for spare blades. One choice you might like to think about is whether or not to have castors. 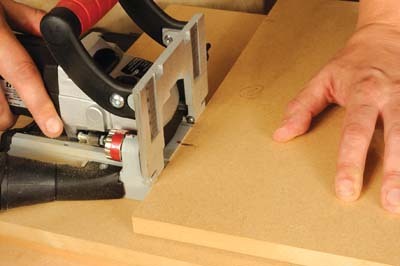 These make moving the saw around a little bit easier, though they can be expensive. I've just gone for MDF pads underneath the cupboard - this solution means it can slide around nicely, is very stable and, of course, cheap! 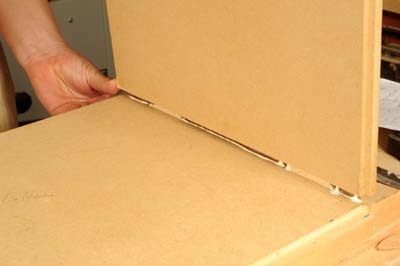 15mm MDF for the carcass and door, and 9mm MDF for the backing board are my materials of choice. 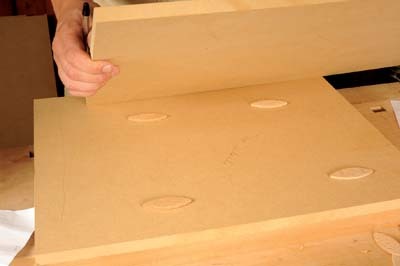 MDF is also easy to machine and very stable... just be careful of the dust. MDF does break up quite easily, so I used softwood lippings for the front and door edges. 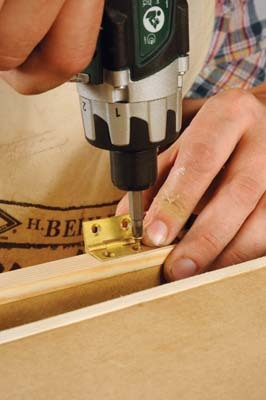 This also gives you something to screw into for the hinges. 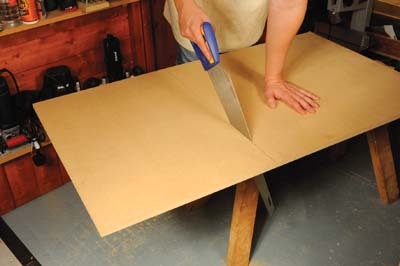 I had the timber yard convert an 8' x 4' sheet of 15mm MDF, to make it easy to transport and then convert. 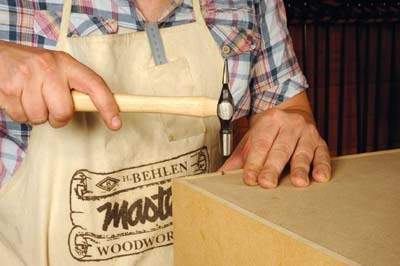 I already had an offcut of 9mm for the backboard, and plenty of softwood for the lipping. 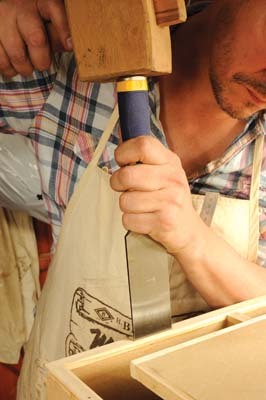 Then it was a case of marking up all the components, before making the final cuts with my trusty hardpoint saw. After years of site work, I'm nifty with a handsaw, so this was quicker for me than getting out the circular saw for the conversion. 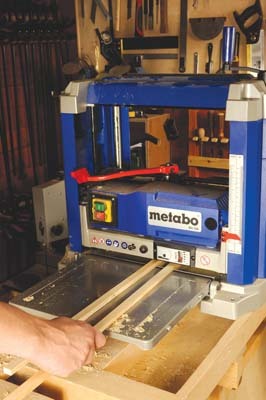 All the joints are biscuited, so first I had to set up the jointer. 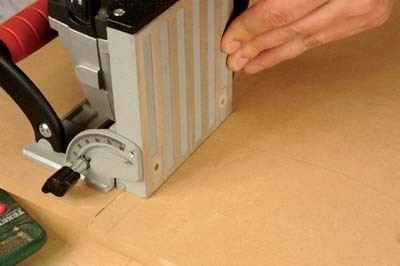 The Trend T20 had never been used before, so I checked all settings before use, and made a test cut to ensure the jointer would deliver accurate slots for size 20 biscuits. I like to keep things nice and easy when using any machine. So, rather than using both fences on the jointer, I propped up the pieces to be end-slotted on four biscuits, which put the slot just off centre when cut. When slotting into the face for the other side of the joint, I knew this gave me a 4mm offset from where the shelves' face edges meet the sides, so marked up the sides for jointing with this in mind. 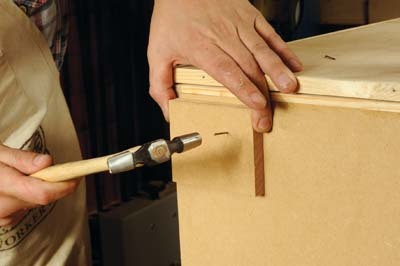 Before cutting your joints, mark where each slot is to go on each joint. 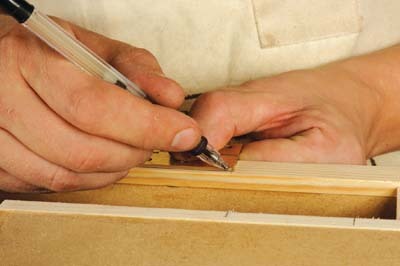 When cutting quite a few biscuit joints in a carcass, make sure you mark each component thoroughly, and even number each side of a joint. 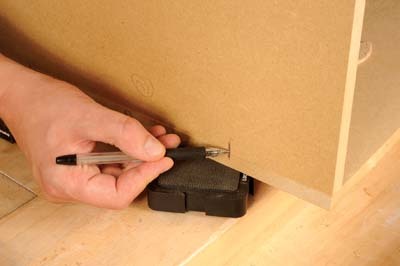 This will help to stop any mishaps when it comes to assembling all of your joints. â€¦and then in the sides, and upright, of the carcass. 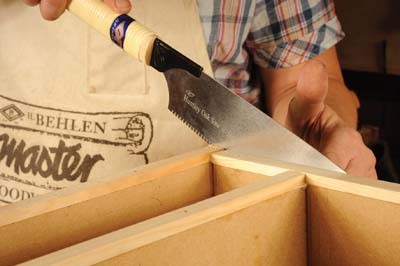 If you are unfamiliar with the jointer, then you might find you want to clamp a straight edge as a guide when cutting in the sides and upright. I find I can work accurately enough free hand, as here. I then disassembled the carcass, and ran a 9 x 7mm rebate around the back edge of the top, bottom and sides... not forgetting to leave the rebates on the top and bottom components short. Now for glue up. 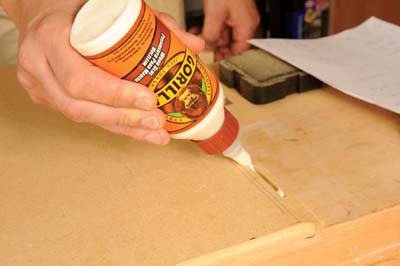 A waterproof PVA glue is just the job for a workshop environment. So I glued up and assembled each joint in turn. 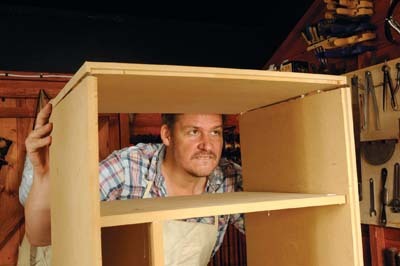 Don't overglue, as you will get too much squeeze out - though MDF is quite porous, so don't skimp on glue, either. 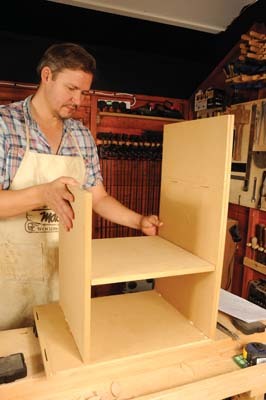 â€¦then finally the last side and its shelf, and then the top. Then it was a case of clamping- up. 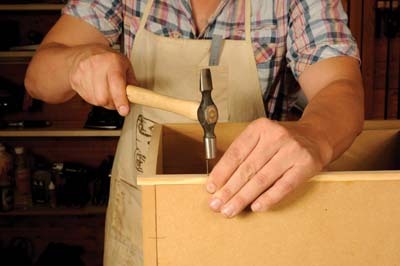 Use clamps front and back to pull the top and bottom onto the sides, and then clamp across each shelf, to pull the shelves and sides together. 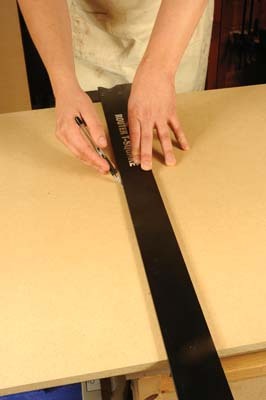 Next, measure across your diagonals to check the carcass has gone together square. 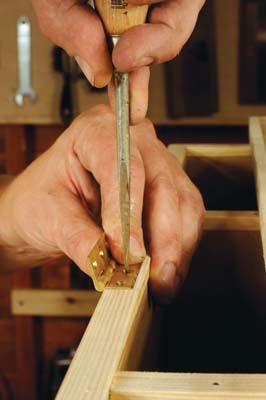 If necessary adjust your clamps, so that the carcass is held perfectly square. Inevitably there will be some glue ooze. I find the best way of clearing off PVA is to let it start to go off, then use an old chisel to scrape off each line of glue... works a treat, and makes less mess than wiping off. Now for the lippings. I had enough softwood offcuts to thickness down to the required size of 15 x 10mm. If needs be, I could have bought some PAR, or ripped some timber down on the bandsaw. Next, I glued and pinned the lippings on the front of the carcass. 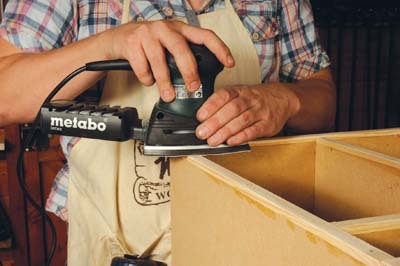 I prefer to apply lippings over-length, pin them in place and then cut off with a flush saw. 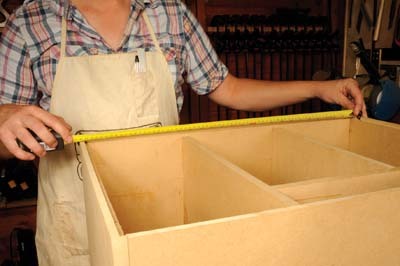 Next, it's time to measure and fit the back panel. I always prefer taking measurements after assembly for as many components as possible, as this can help stop any inaccuracies which creep in during assembly. So, first, I chopped out the corner waste left by the router. Then I measured up the back panel, checking the unit was still square, just in case I had to cut the back panel slightly askew. As it was, everything was fine. The back panel was then glued and pinned in place. 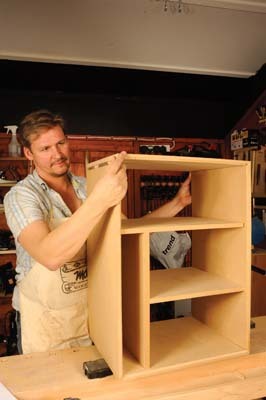 I gave the unit, and particularly the lippings, a good sanding, just to smooth out any irregularities which had arisen during the build so far. Next, I measured up for the door and cut this to size, taking into account the 10mm deep lippings. These where then glued and pinned in place. 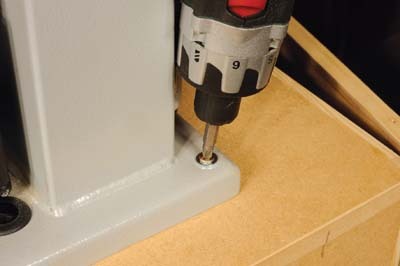 Because the door edges might need a little planing, I punched the pins in nice and deep. I used three 50mm hinges for the door, to keep it on nice and securely. 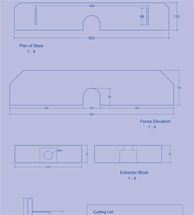 I measured up their positions, before marking up the hinge recesses. 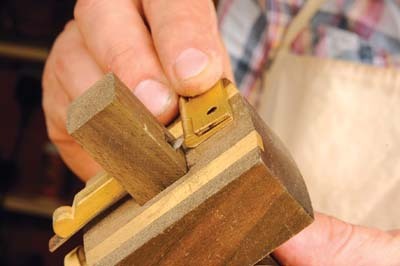 A mortise gauge is a great way of marking up the leaf depth. 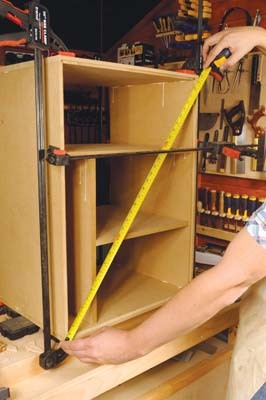 On a workshop build like this, the hinges can just be let into the carcass sides to just under full depth. 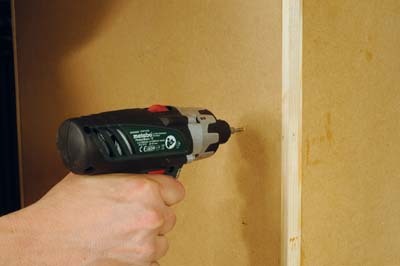 â€¦which were then screwed in place with my 10.8v Metabo drill/driver. After the door was also screwed in place, I next glued and pinned the unit's feet in place. 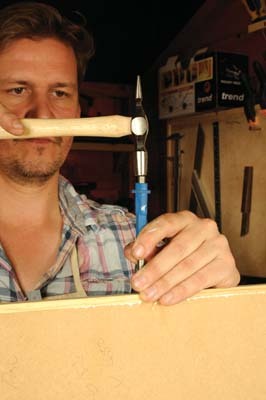 The door takes a nice timber handle, which needed holes drilling 95mm apart, before being screwed in place. I also fitted a magnetic catch to the inside of the door and the carcass. 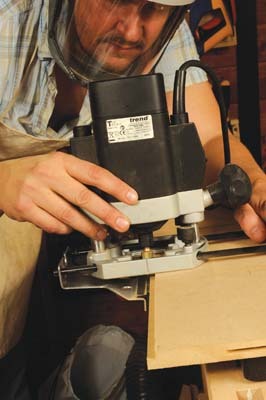 The unit was then ready to take the bandsaw, which I screwed in place to the top, using washers to save the bandsaw frame from any marking by the screws.